Level controller with motor starter equipment for wall mounting. Standard or customer specifiable versions available. All units supplied with a lockable enclosure to the required IP rating. 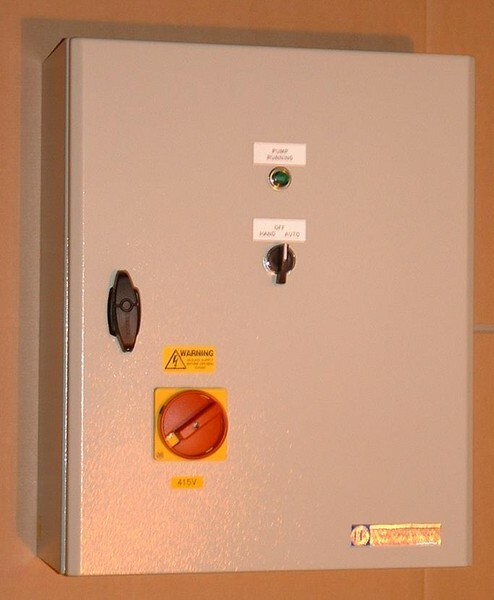 and contains level controller, motor/ pump starter equipment, overloads, fuses, Isolator and optional hand-off-auto switch, pump running/pump tripped lights, alarm indicators, beacons, audible alarms etc as requested. Fully adjustable sensitivity between 100 ohms to 18,000 ohms. Supply voltage as per customers specification.